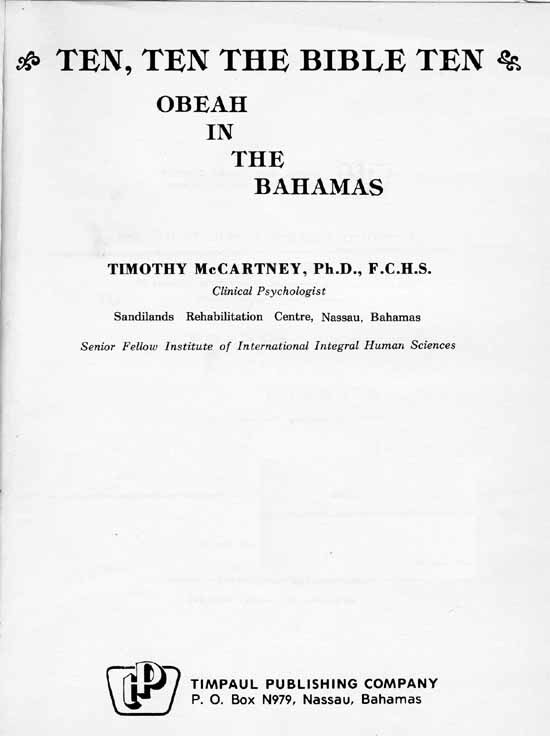 This classic work on magic and psychology in the Bahamas provides a unique and fascinating glimpse into the traditional sorcery of the African diaspora as it evolved in the British Bahamas. Because it is both the best and the most oft-cited book on the subject and quite rare, we have asked Dr. McCartney permission to reproduce it on this website, which he has graciously given. The thing that strikes me about the magical methods described here is how similar they are to the pragmatic sorcery of the old English Cunning Man or Wise Woman. The recipes and formulae are quite similar, a sort of austere "Protestant" magic in contrast to the elaborate performances and embellished altars of the "Catholic" magic of Haiti or other former French, Spanish, or Portuguese colonies. .
We will use the original Table of Contents as the means by which the sections aer accessed. To go to the Table, click here. Printed in the Commonwealth of the Bahamas by the Nassau Guardian (1844) Ltd.